A University of Michigan-led team of biologists headed into the Amazon rainforest to observe predatory-prey relationships between different types of critters and got more than they bargained for. They, incidentally, happened to capture footage of the first known documentation of a large mygalomorph spider preying on an opossum. Yes, the spider killed and ate the opossum. The team was walking through the rainforest when they “heard some scrabbling in the leaf litter,” according to a release from the university. A mygalomorphae is a group of heavy-bodied, stout-legged spiders that includes tarantulas, according to the University of Michigan. 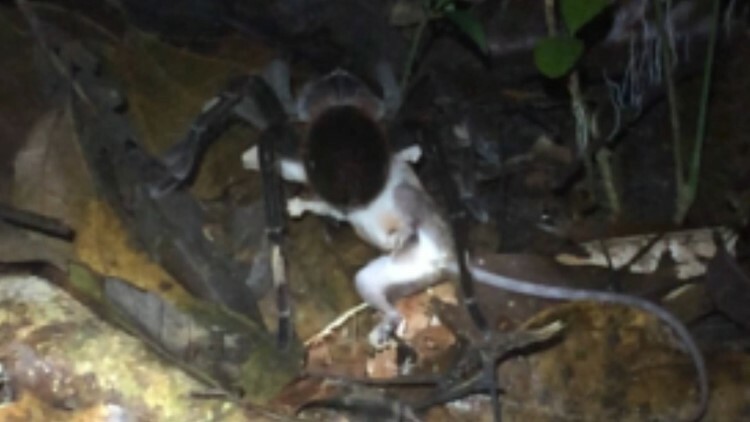 The researchers also documents spiders eating frogs and lizards, as well as a large scolopendrid centipede eating a snake and another centipede eating a dead coral snake it had decapitated. The photos and video are all part of a new article titled “Ecological interactions between arthropods and small vertebrates in a lowland Amazon rainforest.” It was published online Feb. 28 in Amphibian & Reptile Conservation.